iStore - Electronics prestashop Theme is a modern, vibrant and energetic, elegant and flexible theme. This is 100% responsive theme created with elegant design and animation that's focusing on your user experience. This theme also helps you to manage your store commercially. 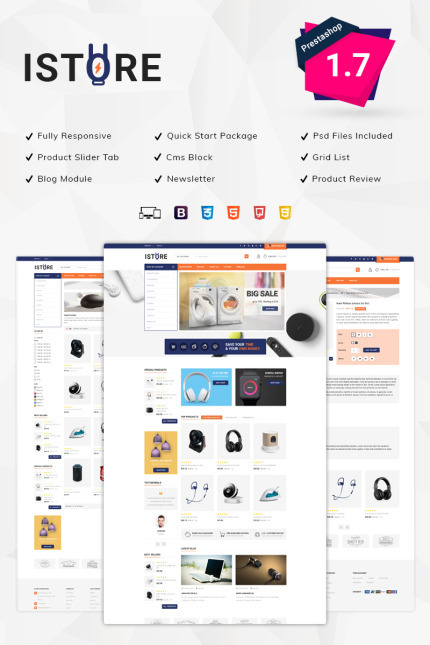 This eCommerce theme is absolute for selling Electronics, Computers, Phones, Cameras, Headphones, Fashion, Bags, Watches, Furniture and different types of products.